The PBE patch isn’t out yet, I’m just compiling official notes here for an easier traversal once the changes start rolling on the test server. [ Note ] Some awesome Redditors have found out the new items and Masteries. Starting Gold has been increased from 475 to 500. Allow Ashe to interact with chance-based crit events in a way that doesnâ€™t compromise her recently-new passiveâ€™s steady damage output. Follow up the changes made to Rangerâ€™s Focus (Q) earlier this year to make the spell a more interesting, engaging part of her pattern. Traps no longer deal damage. Bonus damage is now split between magic and physical, changed from purely true damage. [ New Mechanic ] Special Delivery:Â Every ~5 minutes, Corki receives a special set of bombsÂ on the spawn platform.Â When he picks up the package, he receives the Homeguard boots buff. The bombs allow Corki to cast an improved Valkyrie.Â This mega W has three times the range of Corki’s regular W, knocks enemies aside when it hits them, deals increased damage and slows. Valkyrie’s normal range has been decreased. Basic attacks now fire multiple buckshots in a cone, like Buckshot [ Q ]. They deal more damage the closer the distance to the target is. Base Attack Speed stats and Q’s passive Attack Speed have been adjusted so he is more dependent upon maxing both his Q and W to really approach his full damage potential. [ Dev Note ]Â AP Kog’Maw will play a bit differently than before, but we believe it to be of about equal power to before. Basic attacks have a 0.6 Total AD ratio for the duration of W, but fully apply on-hit effects. Grants Miss FortuneÂ bonus damage when swapping targets (this stacksÂ with Q bounces). Impure Shot’s current active remains on Miss Fortune’s new Strut [ W ]. Empowered attacks now deal a percentage of Quinn’s total AD rather than a base and bonus AD ratio. Half of Aerial Assault’s cooldown is refunded if it kills at least one enemy. Now has a 2-second channel time, but has no cooldown. Skystrike has been retained, but deals less damage and does not deal increased damage based on targets’ missing Health. [ Note ] If you fire a basic attack while in Tag Team, Quinn will instead perform Skystrike and endÂ Tag Team. The bulk of these changes affect ADC items. The current tooltips I took from this Reddit thread and I’ll update with in-game tooltips when the PBE patch is out. [ Note ] Check the above changes to Phage and Sheen for context. Costs less and is a compoonent item used to build new items. Deals more damage to high-health targets. Now additionally grants a minor damage-over-time buff to basic attacks. Can be upgraded to a Hunter’s Potion for a 250 Gold combine cost. Killing a large jungle monster restores a single charge. Now additionally grants Life Steal. At maximum charges, itÂ increases your Auto Attack range by X and gives you a fiery hit at the end (?). Base damage of jungle camps has been decreased. Grants health and mana regen per second, rather thanÂ damage on-hit andÂ lifesteal. Killing the Rift Herald grants a single-target buff that helps with pushing down lanes and towers. The Eye will occasionally open, exposing RH to bonus damage on attacks from behind equal to 12% of RH’s Max HP as True Damage. Grants +0.4/0.8/1.2/1.6/2.0% bonusÂ Ability Power and Spell Damage. GrantsÂ 0.5/1.0/1.5/2.0/2.5% Lifesteal and Spell Vamp, decreased fromÂ 1/2/3% (with 3 points). Grants 1.2%/2.4%/3.6%/4.8%/6% Bonus Armor and Magic Resist, changed fromÂ 2.5/5/7.5/10% with 4 points in T5. Grants 1.6%/3.2%/4.8%/6.4%/8% bonus to all shields and healing on you (includesÂ Life Steal and HP regen). Grants 3%/6%/9%/12%/15% Tenacity andÂ Slow reduction, changed from 7.5%/15% Slow Resist with 2 points from Swiftness and 10% Tenacity with 1 point from Tenacious. Additionally grants 1%/2%/3%/4%/5% Cooldown Reduction. Removed from the store; can still be cast via Sightstone. If you have any questions, feel free to ask me atÂ @NoL_ChefoÂ or e-mail me at [email protected]gmail.com. Be among the first to unlock new PROJECT skins from 9/8 â€“ 9/15 23:59 PDT and show that you were part of the First Strike with permanent exclusive loading screen cards. Once First Strike ends (9/15 23:59 PDT), new PROJECT skins will be deactivated in the League of Legends store until 9/17 to ensure that First Strike unlocks are redeemed properly. On 9/17 00:01 PDT, PROJECT: Fiora, PROJECT: Zed, PROJECT: Lucian, and PROJECT: Leona will be available for 975 RP until 9/24 23:59 PDT (and 1350 RP again after that). Unlock custom spawn effects and PROJECT minions when you and your team equip PROJECT skins or wards for that game â€” only during 5.17 and 5.18! If you start a game with 2 Sync Points, your team unlocks custom PROJECT spawn effects. With 4 Sync Points, your team unlocks melee PROJECT minions as well as caster PROJECT minions. With 6 Sync Points, youâ€™ll unlock cannon PROJECT minions and super PROJECT minions. PROJECT: Fiora will be available for 1350 RP from September 8th to 15th. If you purchase her during that period, you’ll also receive the exclusive load screen border previewed below. From September 17th to 24th, she’ll be on sale for 975 RP. After that, she’ll return to her regular price of 1350 RP. PROJECT: LeonaÂ will be available for 1350 RP from September 8th to 15th. If you purchase her during that period, you’ll also receive the exclusive load screen border previewed below. From September 17th to 24th, she’ll be on sale for 975 RP. After that, she’ll return to her regular price of 1350 RP. PROJECT: LucianÂ will be available for 1350 RP from September 8th to 15th. If you purchase him during that period, you’ll also receive the exclusive load screen border previewed below. From September 17th to 24th, he’ll be on sale for 975 RP. After that, he’ll return to his regular price of 1350 RP. PROJECT: Master Yi is a legendary skin andÂ will always be priced atÂ 1820 RP. If you purchase the skinÂ from September 8th to 15th, you’ll also receive the exclusive load screen border previewed below. 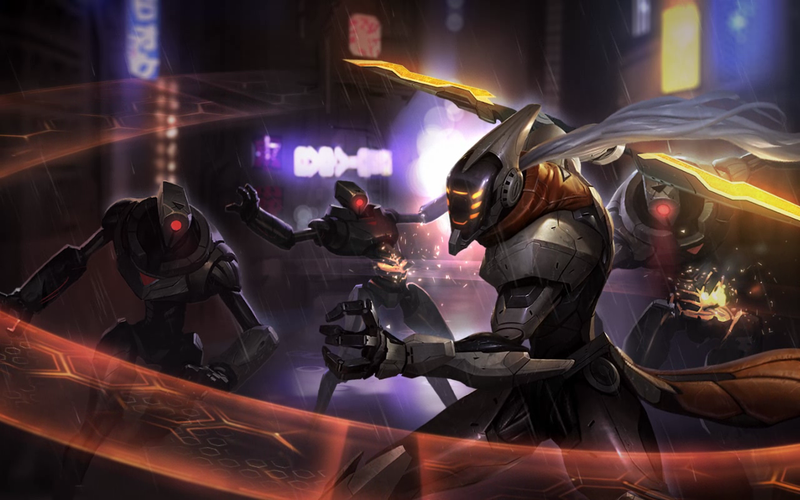 PROJECT: ZedÂ will be available for 1350 RP from September 8th to 15th. If you purchase him during that period, you’ll also receive the exclusive load screen border previewed below. From September 17th to 24th, he’ll be on sale for 975 RP. After that, he’ll return to his regular price of 1350 RP. These six PROJECT icons will accompany the skin releases at a price of 250 RP each. Â Note: This article was not written by me, but by a friend of mine who’d like to write for the site. Â Hey everyone. In this article Iâ€™ll go over last monthâ€™s top 5 Champions for each role in Korean Diamond Solo queue. I will list each pickâ€™s win rate, games played and Kills-Deaths-Assists (KDA) ratio so you have a clear idea of each Championâ€™s potential. There are a lot of unorthodox picks that Koreans use to dominate; personally, I didnâ€™t expect to see some of them make the top 5. Keep reading and find out who the hidden overpowered picks are and why you should consider them for climbing the ladder. Jungling is my main role, so Iâ€™ll start with Koreaâ€™s top junglers. Before we begin: I know Fiddlesticks can be played support and Wukong, Jarvan and Pantheon can be played top or mid, but the key word here is can. In the majority of games you will see these picks in the jungle. I was honestly surprised when I saw Fiddle and Shaco in the top 5, because they are some of the hardest junglers to play properly. Fiddlesticks and Shaco have always been strong and can still carry an entire team, but only if you are really experienced with them. Â They have a plethora of weaknesses your enemies can exploit. so unless you really know what you are doing, I wouldnâ€™t advise playing them in Ranked. The rest â€“ Pantheon, Wukong and Jarvan IV â€“ as aggressive junglers with a solid early game, are pretty straightforward. Theyâ€™re not hard to pick up and, as such, get a solid recommendation from me, even if youâ€™re just now exploring jungle picks and donâ€™t have experience playing them. Note: Kayle data is irrelevant. Â Seeing Kayle in the top 5 comes as a shock to no one, but if youâ€™re thinking about playing her, let me stop you right there. In the last week Kayle has dropped down to a 47.99% win rate due to the recent nerfs and I would advise against playing her, at least until she receives some buffs or a new overpowered build is found on her. For these reasons, Iâ€™ve included Xerath to fill the missing spot. Â Talon has been a great pick for the assassin role ever since Zed got nerfed. I was most surprised to see Akali and Brand in the top 5. Whenever Iâ€™m forced to play mid I tend to pick Akali and I have a pretty good win rate with her (57.1%). That I donâ€™t play laners at all and still manage to do well with Akali should be an indicator that sheâ€™s worth considering in Solo Queue. It bears reminding that Akali and Talon can be played in other lanes, but tend to do way better on mid. Â Also, Katarina and Xerath. Xerath has been gaining popularity and even our lord Faker himself has started to play him. All in all some pretty interesting and unexpected mid laners have become popular in the Korean scene and if youâ€™re wondering what to play you should give them a shot. Â The reason I put Lulu as a top and not a mid laner in my ranking is because I rarely ever see her mid and from watching the pros they also mostly put her top nowadays. As for the fifth place, I was debating between Tryndamere and Ryze, but Ryze is becoming more common on mid than on top. Â The clear oddities here are Rumble and Fiora, who, if youâ€™re looking for someone new to play top, are worth your attention. Â Seeing Kog and Jinx here is no surprise after the recent Bloodthirster nerfs and the rise of hypercarries. Draven is like the Lee Sin of ADCs – useless if bad and amazing if good. On that note, it makes sense that heâ€™s dominating in high Korean ELO, but you shouldnâ€™t pick him up expecting to win without having a fair bit of practice. Miss Fortune and Sivir are fairly unpopular picks, but they can snowball and become carry machines if played well. Last, but definitely not least, the supports. Â Braum being first is to be expected. This guy is insanely overpowered and fun to play; you can try and pick him up, but good luck getting past his 72.5% ban rate. Morgana is the ideal counter to Braum and so logically takes second place. The odd picks here are found later down the ranks; Â I never imagined that Thresh and Nami would be overshadowed by Leona and Blitzcrank, but there you have it . Although a lot of the Champions I listed here are used in NA as well, some of the picks are wildly unexpected and underrated, and thus deserve your attention if youâ€™re looking for a fresh and, possibly, sleeper OP Champion to climb the ladder with. In League, you learn from those better than you and Koreans are leaps and bounds ahead, so learning how they compete is always worthwhile. The following Champions will be free-to-play until April 8th!